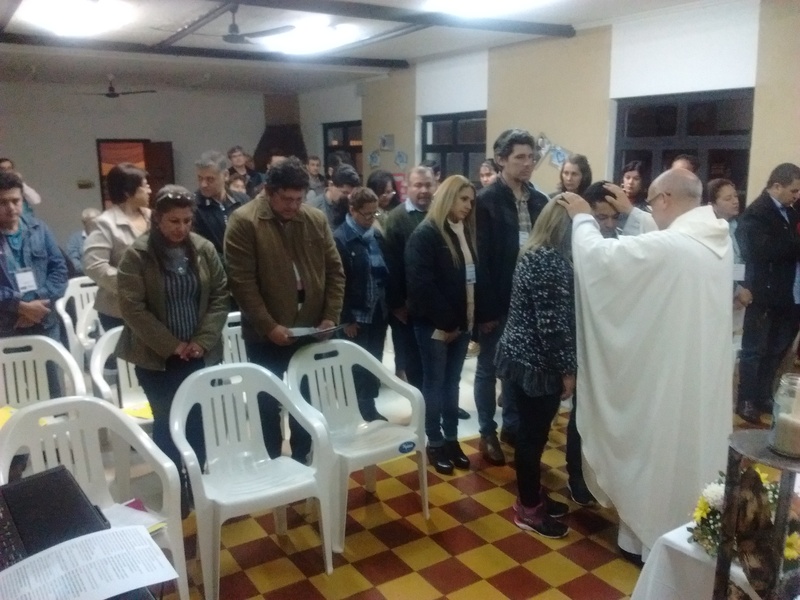 The first Ministry of Hope spiritual retreat in the Diocese of Encarnación, Paraguay took place on July 1st and 2nd. The Ministry of Hope is an apostolate of the Catholic Church favoring those faithful who have divorced or separated and are forming a new family. 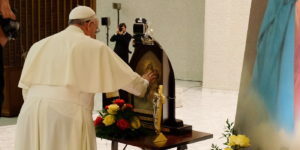 The Ministry of Hope’s origin emerged in the Schoenstatt Movement under the guidance of Fr. Antonio Cosp and some Schoenstatt families – on May 30, 2006 – in the National Schoenstatt Shrine at Tupãrenda, Ypacaraí near Asunción. 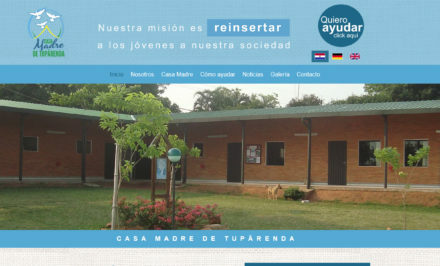 Since its founding eleven years ago, Ministry of Hope today forms part of “Schoenstatt on the way” in Paraguay, Argentina, Costa Rica, and Spain. The following year and also in October, a couple from Encarnación, Julia González and Rodolfo Widmann, attended the second retreat. The topic for the Retreat, this time, was “Our time of loving.” The retreat made such an impact on the couple that they returned to Encarnación filled with energy, rekindled with the Blessed Mother’s love and embrace of Jesus in their arms, and they committed themselves to take the Ministry of Hope to the southern part of the country. 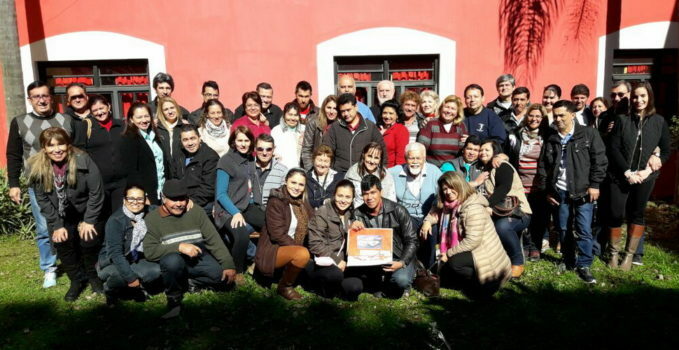 They decided to contact Father Antonio and through some organizational meetings, the Ministry of Hope was founded in Encarnación on April 30, 2009. There was no Shrine in Encarnación, and at that time, there was no place where the Movement’s Branches could meet, except in their own homes. Father Antonio already had some talks with Father Gilberto Penayo, then pastor of Immaculate Conception Church. 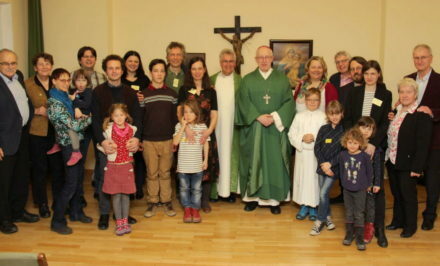 He accepted the Ministry of Hope in his parish and activities began. Time passed and the Ministry of Hope grew. 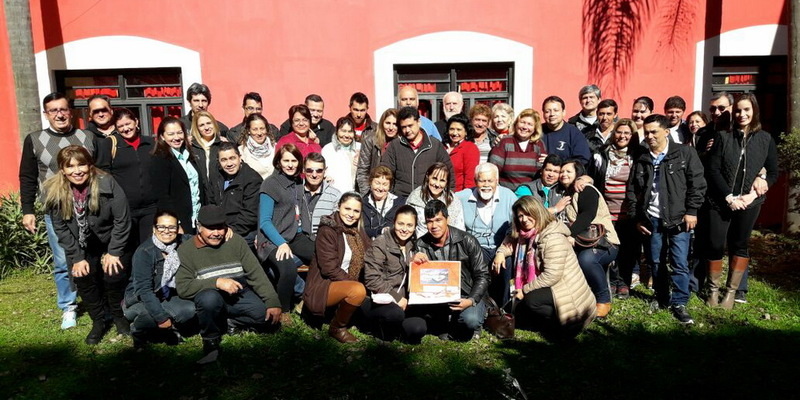 Every year they attended the Retreats in Tupãrenda, located some 380 kilometers from Encarnación that required great effort in order to attend. In spite of that, every year, the Ministry of Hope from Encarnación and Itapua sent more representatives each time. 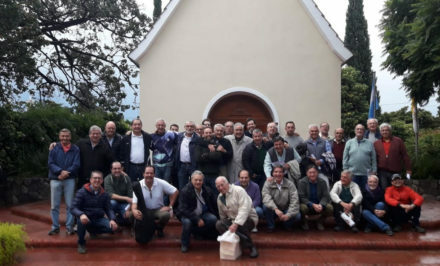 Thus it happened that an executive team from the Ministry of Hope met with Bishop Francisco Pistilli (Bishop of the Diocese of Encarnación and a member of the Secular Institute of the Schoenstatt Fathers) with the idea to have the first retreat in Itapua, who’s See is in Encarnación. After several months of organization, the great event took place on Saturday, July 1st, for two days. The Retreat was called “To walk, lovingly,” and its objective was for participating couples to strengthen their love in order to project it into their families and in their surroundings. In the Retreat House at the opening of the Retreat, Bishop Francisco Pistilli’s presence was moving in his words of welcome and then the celebration of Mass in the evening. “Sometimes we want to say that those married for the first time have an easy life, and you who are separated and in a new relationship could tell me that it is a lie. And we can also say that those married for the second time surely now have an easier life. But you can also come to tell me that that is not true. In reality, what is easy is overrated. I would say that it has to do with life. We have to love that life, we have to take care of it, and we also have to search for a way that happiness, its meaning and its fullness can be found in that life. Therefore it is not about giving you here an easy solution, a prescription, rather, it is about telling you that we are together. The attachment of Communion with you remains. You are members of the Church. Feel that you are and live as members of the Church. Allow us to accompany you in this reality you have to experience, and let us journey together this way to discern what God wants from each one of us, and so that each one can also find that peace needed in their heart and conscience. What is God telling me by giving me a second opportunity? Given that this was the first experience in the organization of this type of event, help was required from the Ministry of Hope from Asunción. On the team of speakers from Encarnación were: Gustavo Cortázar, Antonio Vaccaro, and Karol Espinoza’s families . As the beginning for the development of the topic, Bishop Francisco Pistilli’s excellent welcome was a foretaste of what was to come. Gustavo Cortázar gave the first talk, entitled “Encounter with my inner self.” In conclusion, a workshop entitled “Our inner life” based on the parable of the Prodigal Son took place. Antonio and Carolina Vaccaro gave the second talk and its title was “What is God telling me by giving me a second opportunity?” This talk had a workshop entitled “We are different, but we do not complement each other.” As an additional exercise, a love letter was written where each one of those making up a couple had to write each other a letter to be read later. Later there was time for recreation and it was called “Laughing at one’s self.” The assistants were invited to participate and there were twelve volunteers. The activity ended with an analysis. Margarita and Lauro led the third talk on forgiveness. The topic “Forgiveness, well accomplished” ended with a workshop. From the topic, a living experience came forth from a couple that “opened up” to the others. Spontaneously another couple from the assistants did the same, and it was very moving. 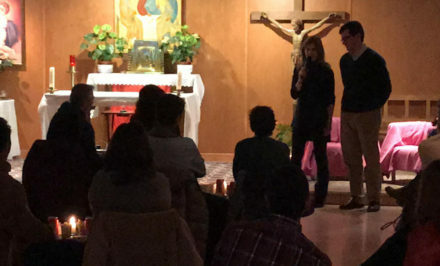 After supper, in the tranquility of the night, Bishop Pistilli celebrated Holy Mass – in which the participants could not partake of the Body and Blood – we all prayed the prayer for “spiritual communion.” Following, Bishop Francisco placed his hands over each couple, and it was one of the most moving moments experienced in the Retreat. Many of the participants had never before had this type of experience. It was very moving and one could feel that God, the Blessed Mother, and the Holy Spirit were present in this place and at that moment. To end the first day, in a hall especially decorated and prepared for the occasion, a party called “Time for loving” took place. The music and the dancing allowed the couples to have a romantic moment where they could express their mutual love. The second day began with Margarita and Lauro giving a talk entitled “Our Commitment” where outlines were presented for putting what had been experienced in the Retreat by each one of the couples into practice. In conclusion, a presentation was made on the new book, “MINISTRY OF HOPE – A BALM FOR THE WOUNDS,” by Father Antonio Cosp, founder of the Ministry of Hope. 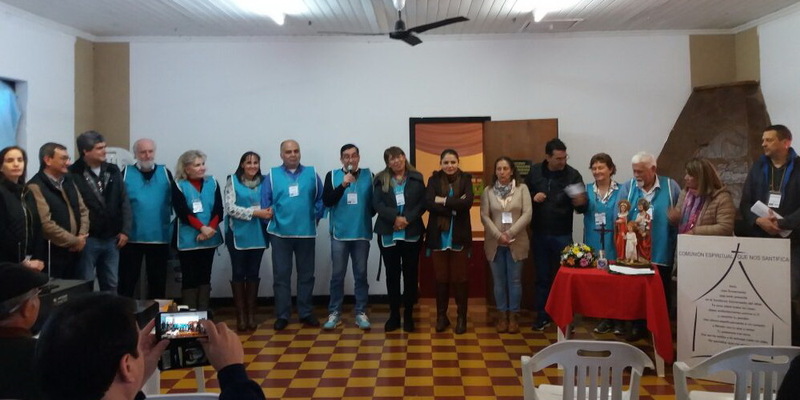 On Sunday, July 2nd, the “first spiritual retreat of the Ministry of Hope of the Diocese of Encarnación” concluded and sixteen couples returned to their homes – some in far away locations – all filled with the Holy Spirit and eager to work with the Ministry of Hope in their parishes and especially in their homes. And we, the organizers, were happy to have been the Lord’s instruments. He gave us the strength and the bravery to realize this first Retreat that surely will be repeated within a year and with more participants. It is our wish that the seed they have taken falls on “fertile” ground.